Please note that you can only share instances of NSString, NSURL or UIImage. WhatsApp does not support sharing text and images at the same time, so as soon as you provide an UIImage all NSString and NSURL instances will be ignored. In addition you can only share one UIImage. Have a look at the demo app to see it in context. 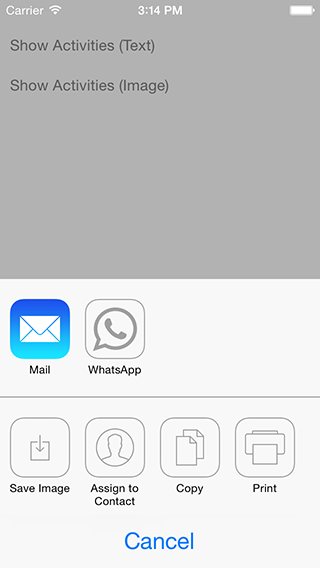 SSCWhatsAppActivity is available under the MIT license. See the LICENSE file for more info.